Plasticjungle.com is the most reputable internet site for trading and selling of second hand gift cards. It provides you with the most convenient and secure way for you to get what you want. With plenty of options which include My Wallet, it features a special way to help you track your gift cards and get instant alerts on your email. Plasticjungle.com also guarantees every transaction with its unmatched security features. If you want to sell your unused gift cards, Plasticjungle.com can buy up to 92% of the gift card balance from you. There is a minimum limit though of $25 before you can sell a gift card in plasticjungle.com. Also in case you don’t want to mail your gift to Plastic Jungle to sell it, you can go online and send your gift card using electronic methods. Selling gift cards on this site is very easy to do, It accepts virtually almost any gift cards and you can choose whether you want to be paid in cash, check (which will be mailed to you), get paid directly to your PayPal account or receive an Amazon.com gift card instead. You will receive the payment for your sale within 3 weeks from the date of sale because Plastic Jungle has to validate the gift card that you sold. If you are buying gift cards, you should get a confirmation of your order within 2 business days from the date of purchase. The gift card will be delivered to you in a standard priority envelope within 5 to 7 business days. 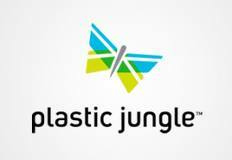 Plasticjungle.com sell, buys and even trade gift cards with the benefit of free shipping. The moment you sold your gift card to plastic jungle, you will get an email for your shipping label. Just print the pre-paid shipping label and have it sent out, Plastic Jungle will process the rest. Plastic Jungle gives you the option to exchange it to another gift card. If you are searching to buy a specific gift card but it’s currently unavailable, you can opt to get email announcements about the certain gift card you are searching for once it becomes available in the system. Plasticjungle.com even has its own Facebook and Twitter pages on their webpage. This is a good way to know what people have experienced so far about the company through their social media accounts. Plastic jungle offers you plenty of categories for different gift cards and you will never run out of gift cards to select. It buys, sells and trades more than 400 retail store brands of gift cards, so finding the perfect gift card or selling your gift card won’t be a problem. 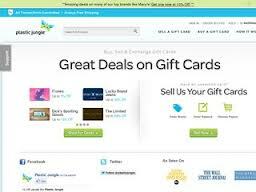 Compared to other online gift card retailers, plasticjungle.com has always offered a good variety of gift cards from time to time. Finding your way around plasticjungle.com is very easy to do. The format and overall appearance of the site makes it simple to find the item you want. You can start searching the inventory and even get a price on the gift card you want to sell without creating an account first. Once you are ready to sell or buy a gift card, you can easily set up an account right away. Looking for a gift card to buy is always a no brainer on plasticjungle.com. You can look for a certain gift card using different categories lie the card type (electronic or physical gift card), price, category, brand, or specify any search word in the search box. The system should give you a quick search result of what you are looking for. However, expect that the transaction process at plasticjungle.com can be a bit time consuming as it will take some time for all your transactions to be completed. Plasticjungle.com always gives an assurance whether you’re selling or buying. If you are selling a card, Plastic Jungle guarantees on time payment once they receive and validate the amount on the gift card. It is also very easy to reach customer support using the online form and expect to receive a reply within 1 business day. Thinking of buying and selling a gift card, why not try it on plasticjungle.com? Now that you know the good things about it, why not check it?